I have recently changed the programme I use for sending out newsletters. The newsletter now comes via "Mailchimp". In spite of its silly name, it's much more user-friendly and I hope to be sending out a bit more frequently as a result. Don't worry, though, I won't overdo it! If you haven't signed up for the newsletter yet, do it now! There are special privileges for members of the Bandon Pottery Mailing List. Now that so many people have facebook accounts, many businesses find posting on facebook works well as a way of keeping in touch with customers about new products and getting feedback about what customers want. So I've set up a Bandon Pottery facebook account. Please be patient with me: I'm a real beginner at social networking. You can check out the page here. Please "like", comment, share and spread the word! Customers who order by email or telephone can now pay me by credit card on the Paypal secure site. It's very safe and easy. When we agree a price inclusive of postage, I email you a Paypal button that you can click. This brings you to the site where you can pay. Usually the payment goes through in less than 24 hours, and I despatch your order the next day. Customers who come to the shop, or anyone who doesn't like PayPal, may still pay by credit or debit card with my new mobile chip and pin reader. 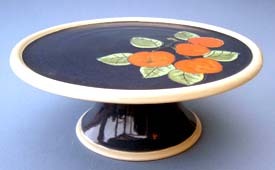 When a customer asked me to make a cake stand last year, I was a bit puzzled about how to do it. Stoneware begins to soften and deform in the glaze firing (1260°C) and unless wider pieces like plates are fully supported in the kiln they are likely to be badly warped. The solution is to throw them in two parts and unite them with good old epoxy glue. Before Christmas I sourced some neat little bearings, and now I can make rotating cake plates too (aka Lazy Susans or Dumb Waiters). These are great for decorating and serving very special cakes or wicked desserts. There's a wide choice of colours and designs. I can also customise them with Birthday or other messages, If you'd like me to make you one, just send an email or call me on 023 8847843.